My pantry is always stocked with different varieties of canned beans and of course canned yellow corn. 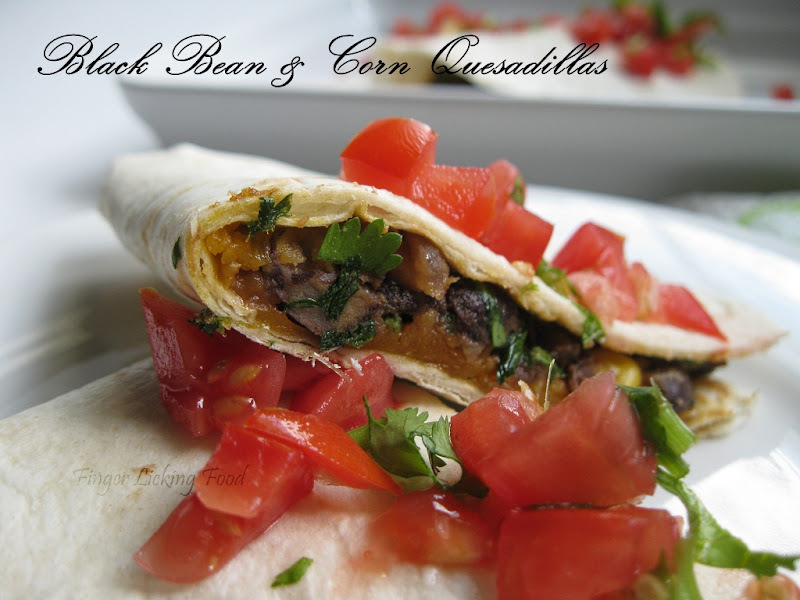 I simply love the combination of black beans and yellow corn and have used it in various dishes in the past. This afternoon I made a simple Quesadilla using the ingredients I had on hand and I was pleasantly surprised how quickly lunch came together. 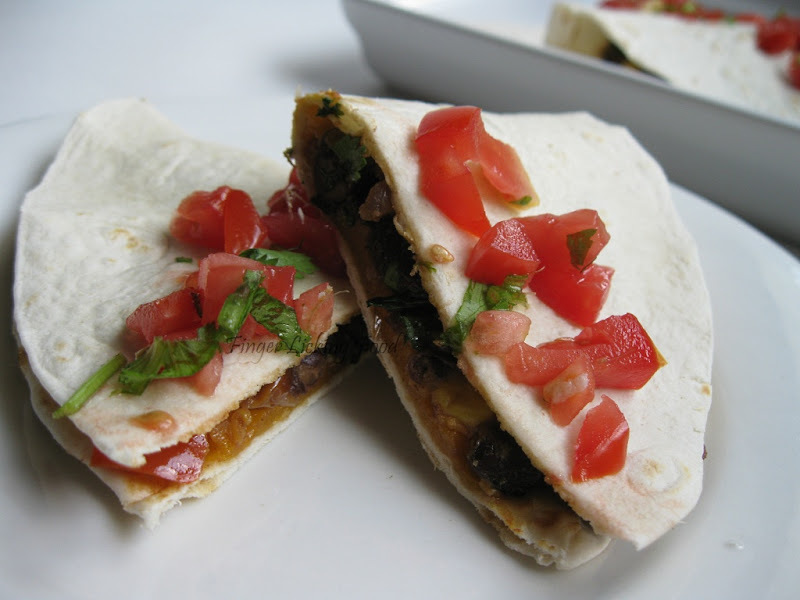 A Quesadilla is a Mexican snack usually made with corn tortillas and cheese. Various other fillings can be used including meat, vegetables and seafood. Heat the oil in a pan. Add the red onions and bell pepper. Sauté till the veggies are soft, about 5 minutes. Now add the corn, black beans, cumin powder and hot sauce. If using frozen corn, cook till corn is done. Otherwise toss to coat all the veggies with the cumin powder and hot sauce. Cook for a minute and turn off heat. Let cool slightly and then top with chopped cilantro. Heat a cast iron skillet, place a tortilla and warm through 10 seconds on each side. Place tortillas covered till ready to use to prevent them from turning hard. 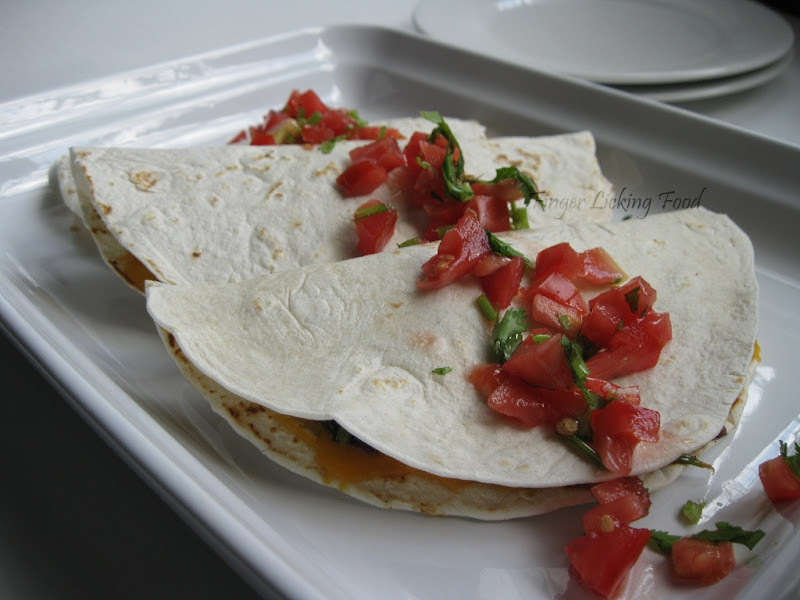 Take one tortilla, on one half of the tortilla, place about a ¼ cup of cheese and spread to cover the half. Place a spoonful of the bean mixture over the cheese. Flip the other half of the tortilla over the filled side. Slowly transfer to the hot skillet, and cook till cheese melts. This needs to be done on low heat, to prevent the bottom part of the quesadilla from charring. Once the cheese has melted, remove from heat. Repeat with remaining tortillas. Alternately, you could fill the tortilla while its on the pan, and press another tortilla over the filled one, basically sandwiching the cheese and bean mixture. Cook till cheese melts and then cut into wedges. If you have left-over bean filling, store in an air tight container in the refrigerator. You can toss it with cooked pasta or eat it just the way it is. 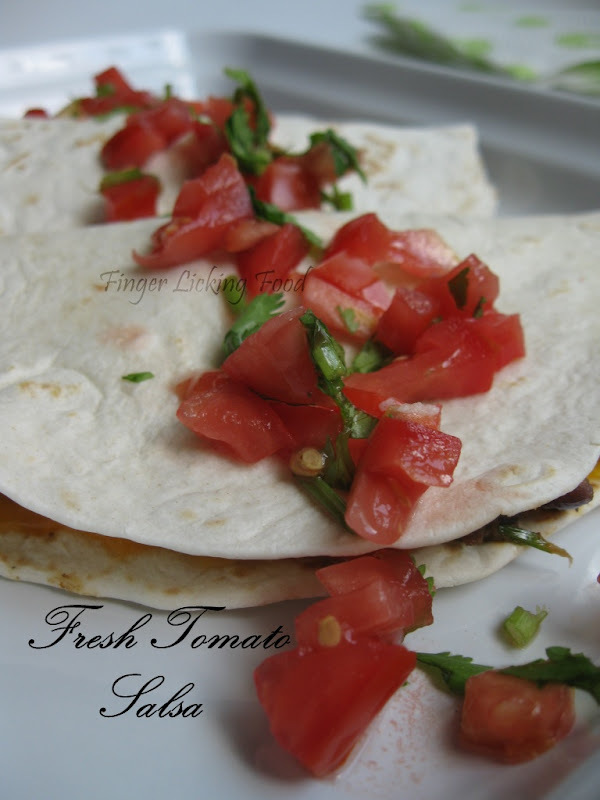 We had our quesadillas with a fresh tomato salsa. In a small bowl combine a chopped roma tomato, 1 tsp chopped cilantro, salt to taste and a chopped green chilli. Let sit for 30 mins and then spoon over quesadillas. The colours are a feast to the eyes and the flavours...mmmm you would have to try it to savour it. A healthy lunch in a snap! Enticing pics Nam. Really nice clicks. Love to try at home. Bookmarked! :) Thanks for sharing it. Looks really yum, Namratha! I grill the tortillas after stuffing them. The pictures look bright and nice. Looks delish!